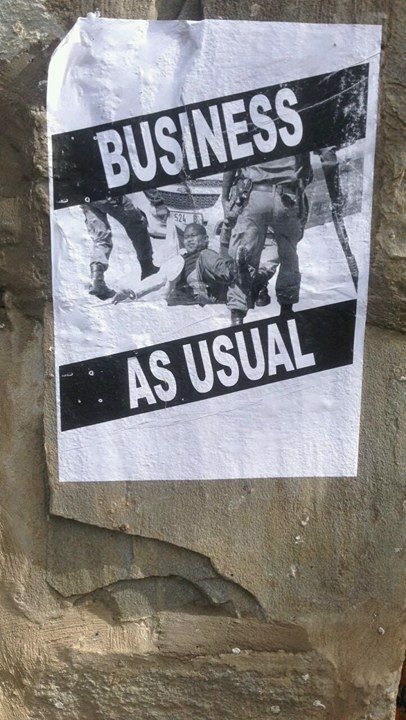 The photo that is posted on the street is from September 28th, 2016 when the University Currently Known as Rhodes(UCKAR) allowed South African police officials to drag, threaten, and shoot at students who were fighting for free, quality, decolonized education. Since that date, this photo has circulated alongside many others. The purpose of the words “BUSINESS AS USUAL” on this image is to critique my host universities lack of making any strides towards supporting students in their fight towards free, quality, decolonised education.